Design thinking breeds innovation mindset. In order for a team to co-create a successful and innovative product or service, design thinking and design tools are paramount in today’s cut-throat competitive environment. Design thinking acts as an interface between business, technology, products, services and consumers. Design thinking is a non-linear iterative process that helps us in creating business innovation. The different stages of the design process includes: identifying the problem or improvement area; generating ideas; developing and delivering the business model. 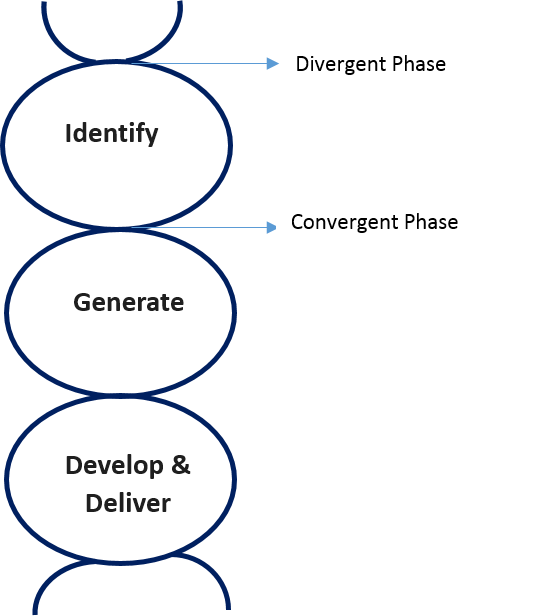 Each of these stages can be broadly classified under two characteristics: divergent phase and convergent phase. Our team was set on a mission to co-create a successful and innovative business model for improving the approach to learning in Laurea. With this mission in mind, we were able to deploy the design processes, tools and techniques to create a business innovation model. During the first stage of the design process, several design tools and techniques are employed in order to identify the problem or improvement area. In the divergent phase, we used mind-mapping tool to broaden the scope of the problem set. With “Learning in Laurea” as the central topic, we generated several sub-topics as branches and associated metadata as twigs. Lots of visuals, diagrams, drawings are used to create these mind maps. These maps provide a visual representation of the information gathered from different sources and provide new perceptions about the project in horizon. In the convergent phase, our goal is to select one of the sub-topics “Approach to learning” as an improvement area. This is done after careful observation and analysis of the mind maps. An unstructured observation technique, wherein the team co-observes the mind maps, is followed to narrow down the focus area. After selecting the problem or improvement area, we gather together to generate ideas and translate the framework into a hypothesis for target business solution. During the divergent phase in idea generation stage, the selected sub-topic for improvement is discussed at varying lengths and breadths from different angles using verbal and non-verbal strategies. We get a broad perspective of ideas from lots of sources including consumers, customers and business partners. The divergent phase of idea generation involves a lot of design thinking tools like Photo Safari, Interviews, mood board and brainstorming to name a few. In the convergent phase at this stage, our efforts are focused in doing target selection and hypothesis formation. This phase yielded our hypothesis: “To provide a mentoring solution for discovering student’s strengths and weaknesses”. Throughout this stage, the tutor acted as a facilitator providing guidance when and where required. In this stage, the hypothesis is translated into a clear business model with the help of several design thinking tools like storyboards, sketches and prototypes. During this divergent phase, our business model “Coaching lab” is prototyped using Legos. They provide a visual communication of the business solution from start-to-end perspective. These prototypes are improved further after receiving feedback from different stakeholders. The convergent phase at this stage involves communicating and delivering the innovative business model to the stakeholders. Before starting this course, I was of the opinion that creativity and innovation comes from in-born gifted talent. But the ‘Design Thinking’ course has defied this belief in me. On the whole, the ‘Design Thinking’ course provided deep insights in cultivating a creative and innovative mindset in building business models. This has helped me personally to conceive several business ideas developed in a much leaner way and those are put in incubation. I owe this to the ‘Design Thinking’ course and without which this would have been impossible for me. Brown, T. 2009. Change by Design: How Design Thinking transforms organizations and inspires innovation. New York, United States: HarperCollins. ← OpenFin Challenge – How did we succeed within 22 hours? I agree that one does not have to be naturally creative but the DT tools help you to create and to innovate. Also your team helps you: the more you have people with multidiscipline background the better. Katja Tschimmel said that there are several types of intelligence and I can imagine that a service developmen team with different abilities and intelligence would be highly recommended in order to look at the issue from different aspects, to take all possible aspects into account and so on. One type of intelligence is empathy and that is essential in order to fully understand the customer point of view, what she/he really needs, would need, how she/he would experience something and so on – and the ability to use that empathy and to put that information into the service development process.